With the ELTWIN cloth guiding systems, the web edge is scanned either mechanically by a sensor lever or without contact using optoelectronics. The sensor signal controls a diaphragm cylinder or a lifting magnet that presses the control roller against the counterpressure roller. 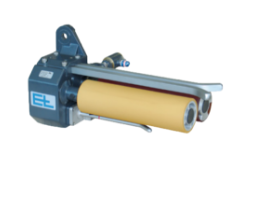 The web edge is controlled by roller offset and contact pressure of the web guiding rollers. The web guides have a compact design and are always used in pairs. An adjustment support is available in various versions for positioning of the web guide. ELTWIN cloth guides are used for web guiding in textile production plants for woven and knitted fabrics. A vertical web run is preferred for cloth guides. The infeed path should be at least one web width. By contrast, the outfeed path to the locking roller should be kept as short as possible.